Vultures "skeletonize" a human corpse. For science. You can learn a lot about an animal by watching it eat, but sometimes scientists are more interested in the creature being eaten — especially when that creature is a human. Researchers Katherine Spradley and her colleagues at Texas State University-San Marcos have conducted a pilot study examining what they describe as "the effects of vulture modification to human remains." Basically, they wanted to know how quickly and in what order various parts of a human corpse are picked clean, ripped apart, and dispersed throughout the surrounding area (i.e. the area surrounding the resting place of the original, intact body). 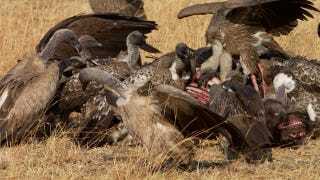 It's definitely gruesome research, but it turns out there's a perfectly practical explanation for the study: let's say a search team or a pack of unsuspecting hikers happen upon a human body (or body parts) in a wilderness area where vultures are known to scavenge. After the body has been discovered, detectives can have a difficult time determining the time of death. By studying how these carrion-eaters dismantle a human meal, researchers like Spradley hope to make these detectives' lives a little easier. "Vultures throw off the time-since-death estimation significantly," explains Spradley to New Scientist's Paul Marks. "Prior to our study, if you came across disarticulated remains you would assume that they were dismembered by a carnivore — and then remain puzzled when there are no gnaw marks typical of carnivores." Spradley and her team of researchers report that the "fully-fleshed individual" used in their study was reduced to a skeleton in just five hours, but more experiments must be done, and there are a lot of other details about the vultures' scavenging habits to consider. You can read more about them over on New Scientist, and in last month's issue of Forensic Science International. Top image via New Scientist.